Posted By Carlos On February 1st 2017. Under Annotated Bibliography Tips Tags: ieee bibliography maker, ieee citation style, ieee format for reference . Most of the times, we are held up with so much and we might not find time to work on all the tasks and complete them in good time. One of these might be coming up with a perfect bibliography that will not need any revisions or corrections thereafter. IEEE reference is a citation style that is quite popular and has been used over the years. It basically attributes credit to particular authors whose findings, facts, as well as theories, have contributed to a particular research paper or thesis. The format serves as the standard referencing style and it was set up by the Institute of Electrical and Electronics Engineers. You always can use some annotated bibliography example, but often it’s not enough. Our professional IEEE bibliography maker is a tool that will be able to take care of your bibliography. It will be able to save you a lot of time. With it you can be able to format references quickly, simply and smartly in the IEEE style. It will relieve you of the stress of having to follow the series of guidelines for formatting your bibliography if it relates to electrical engineering and related disciplines. As you get ready to start writing your bibliography, there are some important tips that you should take care of so that you make sure that you conform with all the guidelines according to IEEE format for reference. You are supposed to use et al. when three of more names are given for the authors. You should follow a specific format while writing the citations for the bibliography. The general form involves beginning with the name of the author(s) followed by the title of their work. There is a set of standard abbreviations which you use in place of the full words. This is used while making a reference. The title of complete works and journals should be underlined while the titles of articles as well as portions of larger works should appear enclosed in quotation marks. While making references, make sure that the reference numbers are set flush and they form a column of their own that hangs out beyond the body of the reference. The name of the author(s) or editor(s) whose works are used as reference is normally abbreviated to the initial only and it comes before the last name. Make sure to follow the rules of punctuation specific to this particular citation style. Use commas around words such as Jr., and Sr.,. When making references make sure to include only information that is relevant. While writing down references in this particular form of citation style, make sure that there will be only one reference in each number. A case of combining references should not occur. Make sure that you conform to the IEEE format for reference so that you come up with a perfect bibliography on you own. Try to use some IEEE samples. 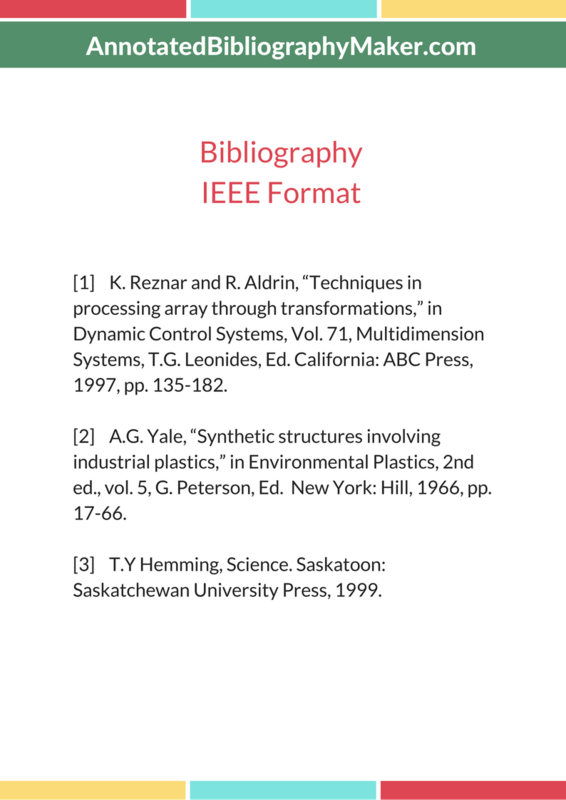 Our experts have worked on bibliographies (including AMA citation style) over the years and they have enough experience when it comes to providing the right advice on how to go about writing IEEE bibliographies. The guidelines have certain requirements governing the citation style. IEEE guidelines state that when you cite within the text, you need to refer to the position of the source within our bibliography or reference list rather than the author’s name. you also need to refer to the page you are citing. In the text, if you are using in-text citations, you should make sure that they appear in brackets. The citations should also appear at the end of the sentence but before the period. Our tool is quite effective and fast when it comes to coming up with a complete and flawless bibliography written in IEEE citation style from scratch. The IEEE bibliography maker generates a bibliography that conforms to all guidelines according to IEEE format for reference. The bibliography is free of all errors since it has been proofread a couple of times before we present the final output to you. 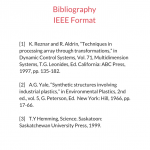 If you need a perfect bibliography written in IEEE citation style, reach us and you will not be disappointed!